We can’t get off of the train! We can’t open the door! If you had been standing on the empty train platform of the sleepy town of Berwick-Upon-Tweed at 10pm on a certain evening in May, you might have heard the desperate banging of four people who were trying to exit the train but could not figure out how to get the door open. No one else seemed to want off at Berwick-Upon-Tweed, which meant we would not be stopped for long. While I was banging on the window, I started to quickly plot out in my mind what would happen if we really could not get off. Could I get us back from the next stop at this time of night? Would the hostel stay open for us? The cruel irony in this story is that I have become almost smug in the fact that I am an experienced train traveler. I know when the optimal time is to book fares in order to get them at the cheapest rate (4-6 weeks). I know to hold on to our tickets and keep them handy for when we leave the station just in case we need to feed them through barriers in order to exit. Of course, I learned this last one the hard way. By not having my ticket accessible (or not having it at all) when I tried to leave the station. In fact, I have learned most of these lessons the hard way. I’ve paid too much for fares because I waited until the last minute. I’ve stood up on a train where I did not have a reserved seat. I’ve been at the wrong platform when I looked at only the city and not the time. But apparently, I still have lessons to learn. My mother’s calm voice interrupted my panic at not being able to open the door to the train. Then she began to read the instructions above the door out loud. But it worked. I lowered the window. And lo and behold, the handle on the outside of the train opened the door. We were free! Walking up the stairs and out of the train station, we were practically falling down laughing as we pictured all the calm, collected passengers on the train hearing us yell for help. Of course, no one could be bothered to actually help the silly Americans who apparently cannot read. Later Taido told me that it must have been an older train we were on. All the doors used to open up that way. For safety, of course. Flash forward to a few weeks later and I am walking the Speyside Way in Scotland with two friends from Arkansas. 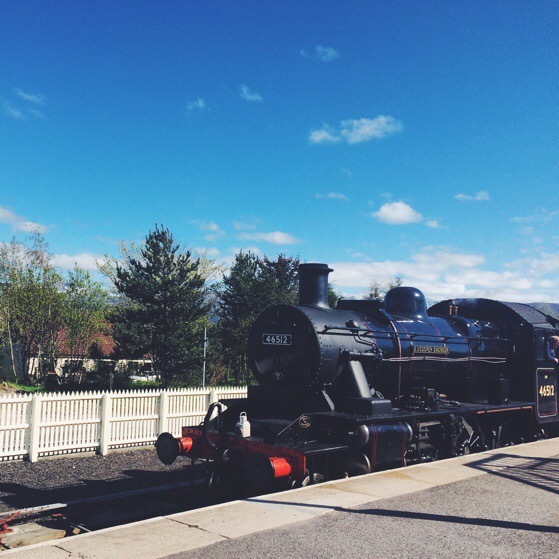 We decide to take an old steam railway for the last six miles of the walk into Aviemore. The train cars are wooden and the wheels are making a clickety-clack noise that is something out of a storybook. The whole experience is absolutely drenched with charm. When it’s time to get off the train, we head for the door and they notice that there aren’t any handles on the inside. 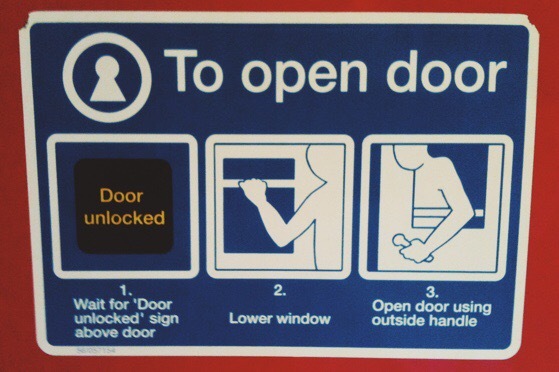 “I got this.” I say, as I calmly lower the window and open the train from the outside.